If Jane Doe rides her bike a mile to the post office and then back home, is it fair to assume she just avoided two miles of driving? And can we then assume that she prevented 2.2 pounds of carbon dioxide from being emitted? That’s more or less the way most agencies calculate averted vehicle-miles traveled. One mile biked is one mile not driven. That simple assumption masks enormous complexity, however. And with at least 33 states and hundreds of cities, towns, and counties having instituted climate action plans or emissions reduction targets, we’re going to need a better method of measuring the carbon that biking keeps out of the atmosphere. It’s not too hard to figure out the carbon savings from reduced VMT. But looking at it the other way around — calculating the carbon-reduction benefits of increased biking — can be a challenge. If bicycling is on the rise in your city — because of bike-share or better infrastructure, for example — what does that mean for your city’s carbon footprint? A mode shift metric that accurately captures this information could encourage municipalities to invest more in biking and walking as a carbon reduction strategy. Not that biking always replaces driving. Some bicycle trips are primarily recreational and wouldn’t be made by any other mode. Or if someone shifts from bus commuting to bike commuting, then they’re obviously not taking a car off the highway (though the newly available space on the bus might then be filled by someone making the switch from driving to transit). Ten million U.S. households don’t have access to a car, according to the Brookings Institution, and regular cyclists are probably over-represented in that number. Shouldn’t it change the equation if a cyclists’ backup mode is transit or walking? But there are also reasons to think that the 1:1 ratio is actually undercounting vehicle miles averted, and therefore underestimating the power of mode shift. The Federal Highway Administration acknowledges some complexity in this problem but its tools are still remarkably blunt. The agency borrowed the San Francisco Bay Area’s measure of how many car trips will be replaced with bike trips if a new bike facility is installed. The assumption is that 1.09 percent of car trips on a project corridor will shift to bike trips. That number is then simply multiplied by the average length of a bicycle trip to calculate VMT averted. For its Nonmotorized Transportation Pilot Program, FHWA estimated the additional trips that were taken by foot or by bike as a result of improvements and multiplied that by the average length of a non-motorized trip, according to the National Household Travey Survey: 2.26 miles for a one-way bicycling trip and 0.7 miles for a one-way walking trip. FHWA’s guidance also notes that the reduction in miles driven could be longer than the actual bicycle or pedestrian trip if those trips are linked with transit. Strategic installation of biking and walking facilities near transit can have an enormous multiplier effect. But to measure it, you need to figure out how many people wouldn’t have taken transit without the walkway or bikeway and how many of them would have driven alone all the way to their destination instead. A Los Angeles Metro survey indicated that 27 percent of people who linked bicycle and transit trips would have taken a car the whole way if there were no bicycle connection to the transit station. Metro didn’t distinguish between those who would drive alone, carpool, or get dropped off. Models assume that a person decides on their destination and then picks their mode of travel. But sometimes the mode choice influences the destination. If I’m on foot, I’m often going to go to the organic grocery store four blocks away, but it’s expensive. If I have access to a car, I might decide to go to a supermarket that’s farther away, but cheaper, and stock up on essentials. Different trip patterns on different modes can complicate the attempt to quantify how much driving is avoided when someone bikes. Studies have shown that cyclists, on average, make more shopping trips than drivers, probably because they buy only what they can carry home. Portland State University researchers found that people who drove visited a convenience story an average of 9.9 times per month, while biking customers visited the same store 14.5 times a month. Land use and social preferences are also key factors. There are community characteristics that won’t change with the installation of a new sidewalk or bike lane. All of these factors would make for some complicated modeling, to be sure. But it’s not impossible. Brian Gregor is a transportation analyst at Oregon DOT. He was instrumental in developing GreenSTEP, a tool that lets ODOT estimate and forecast the effects of various policies on the amount of vehicle travel, the types of vehicles and fuels used, energy consumption, and the resulting GHG emissions. GreenSTEP was used as a model for FHWA’s Energy and Emissions Reduction Policy Analysis Tool (EERPAT). To measure carbon emissions averted, Gregor doesn’t just use fuel economy averages. He looks at schedules of average fleet MPG by model year, all the way out to the year Oregon’s greenhouse gas emission goals are aiming toward, accounting for the full variety of vehicle body type and power train. Also in the mix is each fuel, including electricity, with its particular carbon intensity. His team also factors in, at the household level, the number of people of different ages, their incomes, the land use type (urban or rural), the density of neighborhood, whether it’s a mixed-use neighborhood, the existence of transit service, and other factors — and from there, they determine the household’s likelihood of owning a vehicle, how many vehicles, the likely ages of vehicles, and their likely VMT. That’s how they estimate carbon emissions — first at the household level and then at the state level. Could they have just multiplied the number of cars registered in the state by average VMT by average fuel economy by pounds of CO2 per gallon? Sure. But they wouldn’t have gotten very good data. Is it so preposterous to think someone might use this degree of precision to understand the carbon-reducing power of non-motorized transportation? I can’t find the statistic anymore, but I seem to remember that cycling represented about seven percent of total distance traveled in the Netherlands, even as it accounts for upwards of seventy-percent of trips. Cycling may help avoid only a fraction of total vehicle driving. Cycling can’t replace every car trip, sure, but it’s not accurate to imply that biking has only “replaced” seven percent of the distance traveled in the Netherlands, either. If the Netherlands didn’t have the street infrastructure and land use patterns that make biking so convenient, how much additional total distance would Dutch people travel each year? If biking wasn’t such an appealing option for point-to-point trips, how many more Dutch would own cars and substitute driving for transit trips? If you want to quantify the effect of biking on GHG emissions, you also have to figure out things like the relationship between a bikeable environment and housing size. I’m skeptical that these complexities can be captured and measured on a project-by-project basis. Destination follows mode choice. Too true. If more people really understood that, they wouldn’t cling to their cars so much. Thanks very much for this article. I agree that treating bicycle miles or transit miles as equivalent to car miles is completely bogus. We need to put more thought into it and I am glad people are doing so. Years before I sold my car, I drove 12000 miles per year, just like lots of other people. As I moved away from a windshield mentality, I stopped discounting time wasted in a car and drove less. Eventually I shifted towards a more local way of living, used my bicycle for transportation more often and got rid of my car. I switched service providers, such as my doctor and dentist, to keep my life closer to home. As I added transportation bike rides, I did fewer recreational bike rides, so my total bicycling distance didn’t change much as my car miles dropped rapidly. Absolutely, my mom moved 45 minutes (driving) north of where she used to live and she still drives to stuff in her old town. It’s crazy, she’ll drive 20 miles just to get her nails done when there has to be something closer… at least she has a hybrid, but now she’s retired and starting to see the benefits of spending less time in the car and even has a bike! On a similar note, I often hear people say ‘why would I take transit or bike for 30 minutes if I can drive in 10-15?’ What they don’t realize is that drivers can only drive and maybe listen to music, a podcast, or yell at Siri, but a cyclist gets fresh air, exercise, and happy endorphins. A transit rider gets to multitask (some of our nicest commuter rail allows you to work easily with a laptop too) but when I take the bus I usually bring my knitting or reading, or at least my iPhone. Driving for me has always been stressful so I wouldn’t trade a faster transit time, for all the other things I can do on a bike or on the bus. Plus I’d have to sink thousands of dollars into buying and maintaining a car and I’d rather spend it in my local economy. I think a lot of younger (millennials) and older people (boomers) are realizing this, if anything because we have time but no money. Cycling, transit, and walking also reduce the demand for car parking. Even allowing more space for bike parking, that must encourage different land use and greater density, making alt modes even more feasible for those who otherwise might not consider them. A virtuous circle? Bicyclists tend to be more efficient with their mileage. In your car, you may be tempted to spend a few gallons of gas to shop at a cheaper store across town. A bicyclist is more likely to visit closer merchants. This could be easily implemented and a quick way to encourage people to get out of their cars and see the sun. 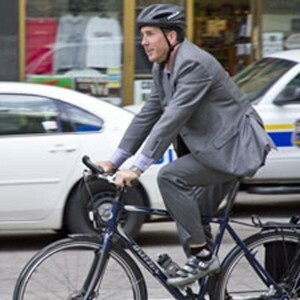 Bicyclebenefits.org is already doing what you are imagining, at least for bikers. Not sure how you could differentiate pedestrians from motorists. It’s proven very popular at my local co-op. Just installing a sturdy bicycle rack in view of the front door is all the incentive that most people need. In terms of GHG emissions, another point to consider is that our heath care system is estimated to contribute 8% of US emissions. Someone who spends half an hour a day biking (or walking) is likely to use half the lifetime health care services of someone who drives everywhere, and hence contribute half the healthcare GHG emissions. It seems so obvious that someone who bikes (or walks) will tend to shop locally, but this is lost on local urban merchants who fight like Tasmanian devils to keep parking at all costs. If urban merchants understood their best interest, they would fight to get everyone who lives within two miles of their store to be as car-free as possible. I can easily measure the driving I avoided by using bikes+transit: 8,000 miles. How? Since I started taking my bike or transit for 95% of my trips my annual car mileage dropped from 10,000 miles/year to 2,000 miles/year. I certainly didn’t ride or even transit all of that 8,000 miles and I didn’t ask someone else to drive me around. I simply shopped closer to home and eliminated longer-distance excursions that really weren’t that important to me. Cycling doesn’t have to account for a very high percentage of distance traveled to have a major effect on the transportation picture. Generally, when people own cars they tend to use them for a high percentage of their trips. If the Dutch can manage seventy percent of their trips by bike, many or most won’t bother owning a car at all because they would see it as a waste. Not owning a car means instead of taking the car for longer trips, they’ll most likely choose bus or train. This is why it’s so important to make biking or walking a high percentage of trips. Once most people pass a certain threshold, they’ll start to see their car as a white elephant. That in turn might induce many of them to go carless. Once people no longer have the option of easily using a car for longer trips, many won’t. That could have a dramatic effect on the transportation mix. In San Francisco many shops have discounts for Bicycle Coalition membership + arriving on bike. For me it’s “why would I drive for an hour when I can get 2 hours of exercise”. I roadrage harder than most though. On the weekends I do as much of my errands by bike as possible. Often the car doesn’t get used on weekends (even though I get 50 mpg). As a result plan more carefully and decide what I really need to get. I think I am less impulsive in my purchasing if I bike. I also consolidate trips much better. I have a trailer with a lockable box, so I can make multiple stops in one trip. Bike (or walk) local, buy local. If I decide to get in my car the local businesses now have more competition for my wallet. The more cycling the less cars and the hugely wasteful infrastructure that the need. I think a more accurate way to think of this is that the Dutch are making shorter trips as a result of making them by bicycle. If my mathematical speculation is right, car travel might generate about 30x the mileage as a bicycle trip, meaning that the Dutch would travel many times more miles if they drove more and cycled less – with all the resulting time spent in traffic, car congestion, stress, emissions, crashes, wandering around parking garages, etc. It’s weird to think of it that way because we do think of destinations as fixed locations. But after 4+ decades of bicycle infrastructure investments and mode shift, the urban form has had time to change and stores and offices have shifted to bikeable locations. It’s more productive to think about it as amount of time spent. Each person has exactly 24 hours in a day–how is that time being spent? For example, if I spend an hour going on a bike ride or walk, let’s say one that is purely recreational without any ‘destination’ at all, what does that one hour replace? Maybe it replaces going to the gym (involves a drive for most Americans), going to the mall (again, involves a drive), visiting friends (again, a drive for most Americans), going to the park (again, involves driving usually), sitting around watching TV or browsing the internet, or some other activity. But for most Americans, most activities involve driving in some way or other. So even (or should we say, especially!) for those suburbanites, getting them biking & walking for some proportion of each day is bound to reduce vehicle miles traveled, even if none of their biking and walking is for ‘transportation’ per se. Because nearly every other available activity under the sun involves driving, and more hours out of the day spent on non-driving activities means fewer hours left for driving. FYI I live in a metro area where we average 10 motor vehicle trips per household per day so perhaps that skews my perception. Not necessarily. If you live in suburbia it is perfectly common to stick your bike on the top of your car and drive to wherever you want to go biking. That’s neither here nor there, because every single thing you do in suburbia requires a car drive to and from. So if it hadn’t been driving to and from a bike ride it would have been driving to and from the mall, the gym, the weekly card game, the kid’s gymnastics lessons, or whatever else people drive to and from all day long. So from that perspective, putting your bike on the car to drive to a ride is simply on par with every other surburban activity–neither better nor worse. But let’s say you drive to some place and then ride your bike for two hours, then drive home. For that two hours you’re on the bike, at least, you’re not driving. That’s my point. Because the typical suburbanite (in our area at least) is on average taking more than one motor vehicle trip every hour of free time (trip to & from work is 2 trips, that leaves 8 trips a day to complete in the remaining 6 hours or so of time awake), that means that the two hours of biking is taking the place of more than two normal car trips. Now we all know it doesn’t work *exactly* that way–you might spend the next hour making up for lost time on your driving errands and do 5 of them in one hour. But my point is that thinking in terms of time spent rather than trip distance is more productive. This is touched on in the article, but just for example, when I go shopping by bike I generally chose the stores 1, 2 or 5 miles away. By car I choose 5, 10, or 20 miles away. Both trips take the same amount of time. Most people, like me, don’t think in terms of how far the trip is but how much time it will take. If I have 1.5 hours to complete a shopping trip I’ll go wildly different distances if I can go by foot, or by bike, or by car. But for the most part, one activity replaces the other, even though the mileage is very, very different. My time for shopping is done and that’s it. People measure their lives by time spent, not by miles. When I drove, even with a longer-than-average work commute, my yearly mileage was around 14,000 miles, which is pretty much the national (US) average. I drove more to work, but drove less everywhere else because I was sick of driving. Now that I bike everywhere, my yearly mileage is around 5,000 miles. I bike less than I used to drive, but it’s hardly 30x less, and I doubt that I’m unique in that aspect. When Brian Gregor does these calculations for a community (“How the Experts Do It), does he model a community and then go in and measure things like numbers of vehicles, their ages, and VMT to see if his model is working? That infrastructure isn’t “wasteful” if you are a suburbanite and dependent on a car (see flug32). Rather than asserting something that’s an individual value judgement, its more productive to design urban and suburban living spaces that require less infrastructure and use it more efficiently. You get more bees with flowers than with pots of vinegar. Yes, he said he does “aggregate checks” of how total VMT and fuel consumption compare to the model. He said it comes very close, though his model does overestimate the number of vehicles, which they’re working on. In my city (not in Canada), it’s trading 10 to 15 minutes of driving for 60 to 90 minutes of public transport. That’s a harder trade to do. There’s the key: “plan more carefully”. I have long thought that one of the reasons why non-automotive transport is such a “hard sell” in the US is the discipline requred to avoid driving. Whether it’s the physical effort of walking or propelling a bicycle, or the necessity of meshing one’s activities with bus and train schedules, driving appeals to the laziness and impatience that we all have to a greater or lesser extent. Perhaps the problem is the way modern suburbia is built. I know of a town in PA called Narberth. It is very small, and very middle class (median income ~$72,000/year). It was largely settled by Welsh immigrants in the late 19th and pre WWII 20th centuries. Most people there have a real yard. The town has no major suburban arterials within its borders, and a train station is located within the town. The town has everything required for making all daily errands within walking distance, as well as some lovely restaurants. Most people in Narberth walk every single day. It still retains much of what people love about a suburb, but with almost none of what they do not like about a suburb. But it doesn’t ever really financially justify itself. If one works out the numbers, modern suburban infrastructure does not support itself in the long term– ever. Capital Bikeshare Winning Hearts, But How Will It Change the Streets?